﻿ CS Capital Management, Inc. 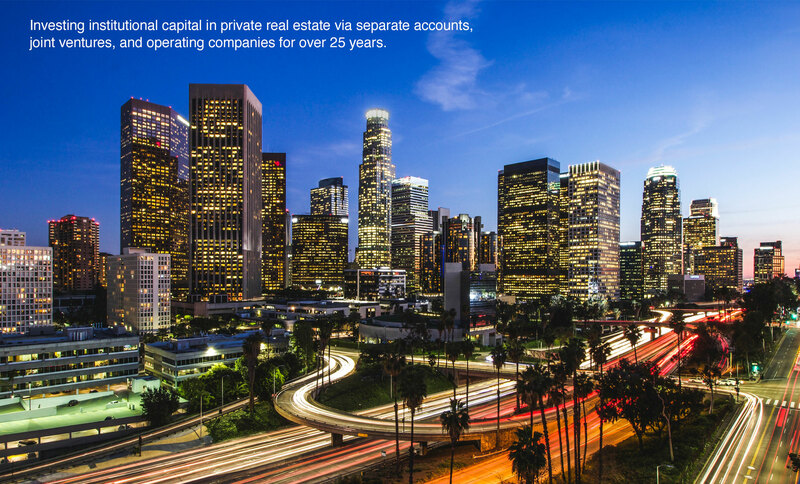 Investing institutional capital in private real estate via separate accounts, joint ventures, and operating companies for over 25 years. advisory company with approximately $942 million* of institutional assets under management. CSCM’s expertise is based on in-depth knowledge and understanding of the institutional real estate marketplace and investor objectives. The Company’s awareness of the industry’s intricacies and relationships sets CSCM apart from other institutional real estate service providers. CSCM strives to expertly balance the constantly evolving matrix of investor objectives within a framework of prudent risk management. CSCM focuses on a select group of institutional investors forging relationships of trust built upon integrity and the highest degree of fiduciary commitment. CSCM was established in 1991 and it’s current senior management team represents over 87 years of institutional real estate experience. Institutional investment programs are customized to specific investor objectives within a framework of prudent risk management. Advisory services are focused on portfolio strategy formation, performance assessment, and independent fiduciary representation. CSCM specializes in direct equity real estate investments in discretionary and non-discretionary capacities. Rigorous due diligence and risk management are paramount to all investment decisions. Separate Accounts which offer fully integrated investment services including acquisitions, due diligence, contract negotiation, asset management, debt placement, performance reporting, accounting, and dispositions. Origination and management of programmatic joint ventures with specialized real estate operators or investors. Facilitation and management of entity-level platform investments in real estate operating companies REOC’s and private REIT’s. Strategy formation and portfolio oversight services provided directly to institutional investors and their respective Boards, CIO’s, and investment staff. Provision of fairness opinions to institutional real estate investors, investment managers, insurance companies, hedge funds, and REIT’s which typically require CSCM’s decision or recommendation reguarding adequacy of valuations, investment structures, and conflict resolutions. Independent Fiduciary assignments to address conflicts of advisors or investment managers in representation of both sides of a transaction. Mergers and Acquisitions advisory services to formulate strategy, assess valuation, and manage transactional process. Additional advisory services include special situations involving underperforming assets and capital remediation strategies. Since 1964, Mr. Saylor has been actively involved as a real estate investment manager, consultant, developer, asset manager and investor. He is a Founder of CS Capital Management, Inc. (“CSCM”) and previously affiliated with Chadwick, Saylor Companies. Mr. Saylor has represented real estate tax exempt institutional investors for over 30 years in transactions and programs exceeding $20 billion in value. Today he serves as a Strategic Advisor to CSCM, providing leadership and key input for the Company’s growth initiatives and industry exposure. Mr. Saylor is the former Chairman of National Real Estate Advisors and his memberships and affiliations have included the Urban Land Institute, American Society of Real Estate Counselors, American Real Estate Society, National Association of Realtors, National Association of Real Estate Investment Trusts, International Council of Shopping Centers, National Council of Real Estate Investment Fiduciaries, Pension Real Estate Association, National Multi-Housing Council, International Real Estate Institute, and the National Association of Real Estate Editors. Mr. Saylor has served on the Advisory Boards of numerous industry publications, is a contributing editor to various publications, has been a frequent speaker at real estate conferences, and has participated on various boards. Mr. Saylor received a Bachelor of Science Degree in Economics from the University of Virginia and completed post-graduate studies at the University of Connecticut. Mr. McHargue is the President and CEO of CSCM, with responsibility for client relations and operations of the firm. He also oversees the firm’s Investment Management services with $942 million of assets under management. On behalf of CSCM’s institutional clients, Mr. McHargue supervises the investment program for each of the firm’s accounts, including all major initiatives involving acquisitions, dispositions, and financing activities. Mr. McHargue also shares responsibility for the management of entity level investments, often residing on the Board or Management Committee of Portfolio Companies. Currently, Mr. McHargue sits on the Board of Directors of National Real Estate Advisors, an SEC-registered investment advisor with gross assets of $5.5 billion. He has completed investment advisory assignments, including entity acquisitions, for assets exceeding $4.0 billion in gross value, in addition to his oversight of real estate acquisitions in excess of $2.7 billion. His experience covers all real estate classes, with a focus on complex deal structuring, strategy formation, portfolio structuring, and entity level management. He earned a Bachelor’s Degree in Business Administration with a dual concentration in Finance and Information Systems from the University of Southern California. He is a CFA Charterholder and member of the CFA Institute, Commercial Real Estate Development Association (NAIOP), National Council of Real Estate Investment Fiduciaries (NCREIF), and the Pension Real Estate Association (PREA). Mr. McHargue was previously licensed as a FINRA registered representative with Series 7 and 63 licenses. Mr. DePoy is CSCM’s Executive Managing Director and also a Managing Principal. He oversees the Company’s Asset Management Group and is responsible for Portfolio Management, including acquisitions and dispositions. Prior to joining CSCM, Mr. DePoy was President and COO of The Koll Company. In that role, he led the investment and operational strategy for an institutional real estate portfolio consisting of 45 commercial operating properties and five development properties totaling 6.0 million square feet and valued in excess of $1 billion, located across the western United States. In addition, he was responsible for all aspects of the Company including: accounting, HR, portfolio and asset management, property management, and leasing. Mr. DePoy has over 30 years of experience in commercial real estate finance, asset management, acquisitions and dispositions. Mr. DePoy held senior leadership positions with KBS Realty Advisors, Bear Stearns, and Sanwa Bank. He earned a Bachelor’s Degree in Economics from Northeastern University. 2019 © CS Capital Management, Inc. All Rights Reserved.